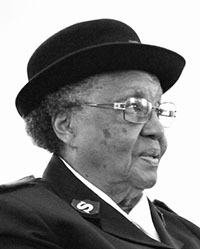 Augustus Funeral Home regrets to announce the passing of Mrs. Dorothy Louise Cann. A Home Going service for Mrs. Dorothy Louise Cann, wife of the late Lionel Ross Cann, daughter of the late Oscar and Gwendolyn Smith, loving mother to Lionel Cann [Lynne], Gladwin Zuill and Robert Cann [Verna], Jean Denkins, sister to the late Grace Mallory and Ivy Simmons, in her 98th year of 24 East Sepertine Road, Pembroke will be held at The Salvation Army, North Street, Hamilton on Sunday, November 25, 2018 at 2:00 pm. Interment will follow the service at St. John’s Cemetery. Relatives and friends may pay their last respects at The Salvation Army, North Street, Hamilton on Sunday, November 25, 2018 from 1:00 pm – 1:55 pm only. Lovingly remembered by grandchildren: Angela [Brian], Andrea, Alisa, Jodie [Emilike], Ryan [Lauren], Kristina, Aaron [April], Sasha [Blake], Robert, Aleshia; great grandchildren: Britanni [Phil], Brian Jr., Hayley, Tafari and-Tye’, Kenfari, Asia, Keniyah, Savannah, Sydney, Justin and Jayden; nephew: Kenneth, Floyd; nieces: Gloria, Harriett, Marilyn, Joycelyn, Shirley, Gloria, Lois; cousins: Samuels, Butterfield, Hollinsid, Jennings, Dowling family, Somerset Family; special friends: Roseclaire, Anne, Gwen, Dr. Clarence Terceira, Salvation Army family. © 2015 Bernews.com. All rights reserved1.